Other Products by Power Crunch. Search other Protein Bars products. 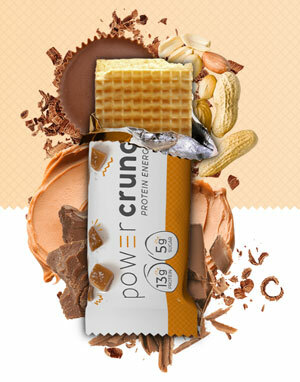 Power Crunch Original Protein bars offer a great tasting Lighweight Protein Powerhouse! ALLERGEN INFORMATION: Contains milk, wheat, soy (from lecithin). This product is manufactured on equipment that also processes peanuts. INGREDIENTS: Proto Whey® protein blend (Micro PeptidesTM from High-DH hydrolyzed whey protein [40% di and tripeptides], whey protein isolate, milk protein isolate), peanut butter (peanuts, palm oil, salt), palm oil, enriched flour (wheat flour, malted barley flour, niacin, reduced iron, thiamine mononitrate, riboflavin, folic acid), palm kernel oil, sugar, fructose, cocoa processed with alkali, maltodextrin, natural flavors, soy lecithin, salt, stevia leaf extract, baking soda, ammonium bicarbonate. ALLERGEN INFORMATION: Contains milk, peanuts, wheat, soy (from lecithin). INGREDIENTS: Proto Whey® protein blend (Micro PeptidesTM from High-DH hydrolyzed whey protein [40% di and tripeptides], whey protein isolate, milk protein isolate), peanut butter (peanuts, palm oil, salt), palm oil, enriched flour (wheat flour, malted barley flour, niacin, reduced iron, thiamine mononitrate, riboflavin, folic acid), sugar, palm kernel oil, fructose, maltodextrin, natural flavors, soy lecithin, salt, stevia leaf extract, baking soda, ammonium bicarbonate. INGREDIENTS: Proto Whey® protein blend (Micro PeptidesTM from High-DH hydrolyzed whey protein [40% di and tripeptides], whey protein isolate, milk protein isolate), palm oil, enriched flour (wheat flour, malted barley flour, niacin, reduced iron, thiamine mononitrate, riboflavin, folic acid), palm kernel oil, sugar, cocoa processed with alkali, canola oil, fructose, soy lecithin, natural flavors, maltodextrin, salt, stevia leaf extract, baking soda, ammonium bicarbonate, monk fruit. INGREDIENTS: Proto Whey® protein blend (Micro PeptidesTM from High-DH hydrolyzed whey protein [40% di and tripeptides], whey protein isolate, milk protein isolate), palm oil, enriched flour (wheat flour, malted barley flour, niacin, reduced iron, thiamine mononitrate, riboflavin, folic acid), sugar, canola oil, dextrose, natural flavors, soy lecithin, annatto, sea salt, sucralose, cocoa processed with alkali, baking soda, ammonium bicarbonate, stevia leaf extract. INGREDIENTS: Proto Whey® protein blend (Micro Peptides™ from High-DH hydrolyzed whey protein [40% di and tripeptides], whey protein isolate, milk protein isolate), palm oil, enriched flour (wheat flour, malted barley flour, niacin, reduced iron, thiamine mononitrate, riboflavin, folic acid), sugar, palm kernel oil, canola oil, dextrose, soy lecithin, natural flavors, sucralose, baking soda, salt, ammonium bicarbonate, stevia leaf extract.